Under the motto better late than never, the second part of the “Made By Us” Beijing Design Week workshop report. As part of the overarching project Made By Us, The New Institute and The Mobile City in collaboration with CMoDA have organized a two-day workshop during the Beijing Design Week. In this workshop participants from various professional and national backgrounds address the reuse of former industrial plants through digital media technologies. The site we worked with is Shougang Capital Steel Factory in west Beijing, which was abandoned to improve the city’s air quality (read more about the factory’s history). This factory is currently being repurposed into a creative industry park and housing area. The challenge is to help design smart media interventions that engage stakeholders in postindustrial development of the vacant factory. The three creative makers who are part of Made By Us – new media artist Sander Veenhof, Niki Smit from game studio Monobanda, and Mark van der Net (OSCity) – guided three teams, each composed of between 4 to 6 participants. The workshop program was structured as an iterative process in which the original question is revisited, ideas tested, and rough prototypes are made for an intervention (product, service and/or approach). Outcomes of this workshop inform the subsequent process of Made By Us in the Netherlands and Shenzhen. More about the workshop background in the call for participation. The aim of day 2 was to zoom in from research and analysis to ideation, concept creation and if possible even initial prototyping. The day was to end at 17:00 with a public presentation. In the morning as participants trickled in, we began by recapping yesterday’s findings at the Capital Steel Factory. What was the main issue at stake? And what types of ideas did the teams came up with? And what feedback did they need from the other teams? We had planned several rounds of group presentations on day 2, meant as a way to test ideas, help each other and reiterate. In the morning the teams briefly presented what they saw as the most crucial question. Team 1 (Sander Veenhof) formulated the issue as how to get people to the site and provide them with the tools to become an active programmer of the space through temporary events. To do so, the team thought it would be interesting to connect Chinese celebration days (spring break, day of the dragon) to local types of craft and makership. The team raised the question whether any of these maker communities exist in Beijing. Members from other teams helped them to provide insights into Chinese maker culture and communities. Team 2 (Niki Smit) began by addressing the issue of scale: how do you program for a vast empty space so big that any intervention – particularly a small media intervention – seems lost? Another issue they wanted to address was branding: how to come up with a communications strategy for the area through a smart media intervention? Their initial idea was to scale up well-known objects like items in a living room, or maybe a giant robot pig that slowly walks around the terrain, so everyone comes to know the vacant factory as ‘the big pig place’. Team 3 (Mark van der Net) wanted to highlight the historicity of the factory. For this team it seemed important to design for graceful continuity rather than sudden rupture. Perhaps it implicitly was an attempt to reconcile ideals of a ‘harmonious society’ with more radical ideas of change. Former factory workers would tell their stories and memories in sound and images, that could be mapped on a platform like OSCity.nl. The team got some good suggestions how to reach out to former factory workers who either still live in the vicinity or have moved along with the factory to its new location. 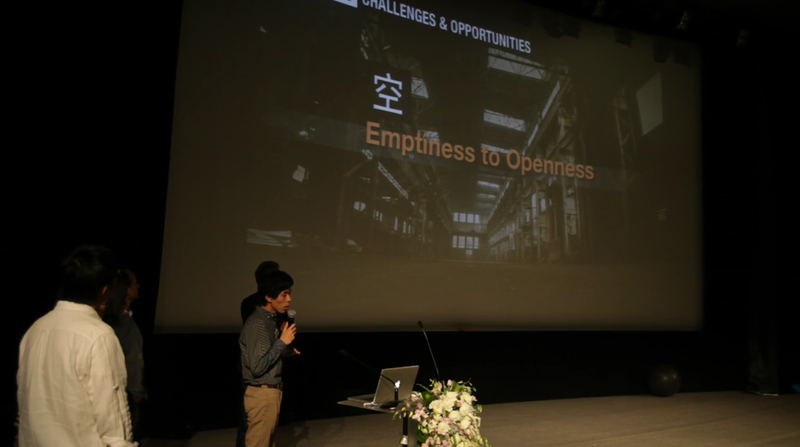 Workshop Presentations Made By Us at CMoDA, Beijing Design Week, Sept. 29, 2013 – part1 on Vimeo. Towards the end of the afternoon the teams prepared for their public presentations at 17:00. We had invited Ole Bouman, curator of the 2013 Shenzhen Biennale of Urbanism and Architecture, to talk about his experiences in redeveloping the vacant Guangdong Float Glass Factory in the peripheral Shekou district, and reflect on the work of the teams. 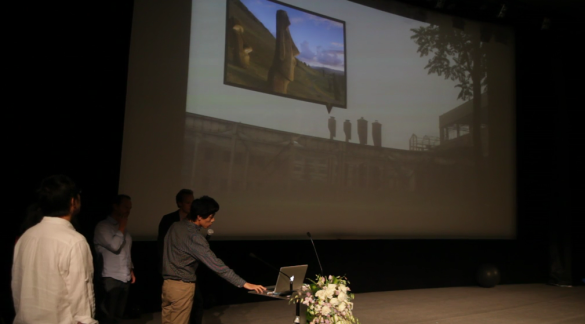 Workshop Presentations Made By Us at CMoDA, Beijing Design Week, Sept. 29, 2013 – part2 on Vimeo. Team 1 (Sander Veenhof, Dayong Sun, Limo, Daxiang, Shangli, Tabo Goudswaard) took a 5-year timeframe as their starting point to develop the place with a “gently warming-up strategy”. For them the main challenge is to get people to the place that is 18 kilometers away from the city center. There are many young makers in Beijing working in coffeeshops on digital devices , but few working spots where they can make physical stuff, like FabLabs. There are some initiatives online. The Capital Steel Factory could be the main maker space. Second, Chinese festivals like the Dragon Festival, Spring festival, etc. are recurrent events that can attract people at set moments. A third strand is the widespread use of smartphones and social media platforms like Weibo and Wechat among young people. The team proposed to combine these into a series of maker festivals in which visitors become creators themselves. They learn how to make augmented reality mobile phone art, which is organized and facilitated by social media. They closed their presentation by offering three choices to the audience for a project title, with the winning title: “WeFactory: release your steel, release you passion”. 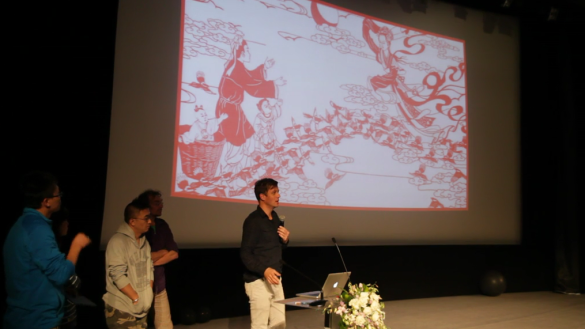 Workshop Presentations Made By Us at CMoDA, Beijing Design Week, Sept. 29, 2013 – part3 on Vimeo. 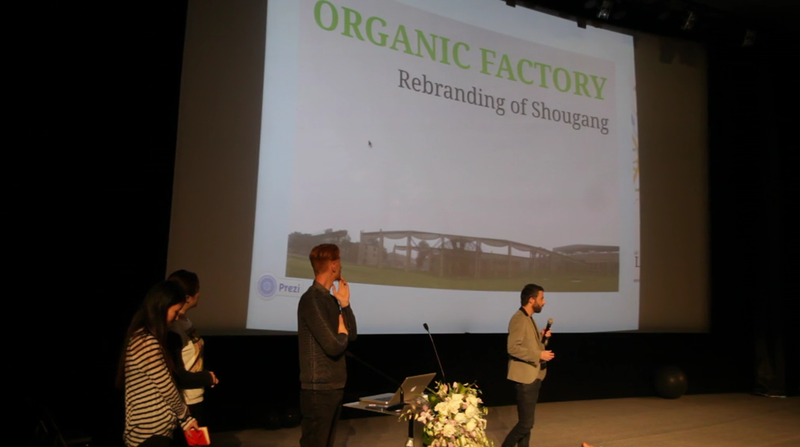 Team 2 (Niki Smit, Eva Xie, Junjie Yu, Max Gerthel) chose the title “Organic Factory: rebranding of Shougang”. There is a huge opportunity to change how people think about the factory, not as a place associated with pollution, but as a beautiful place with old architectural remnants where nature is silently taking over again. It is also located closely to the Garden Expo, a large green space to the west of Beijing. The team proposes a rebranding of Capital Steel into the Organic Factory in three phases. Phase 1 involves a strategy to reach out to locals by creating a public park and botanical garden and allowing locals to rent a garden patch (inside and outside) for community gardening, growing their own food and food festivals. In phase 2 digital technologies come into play. They can help people to tend to their garden through robotic planting pots, light and water sensors. They also allow for social interaction, for instance in a ‘Steal Vegetables’ social game. 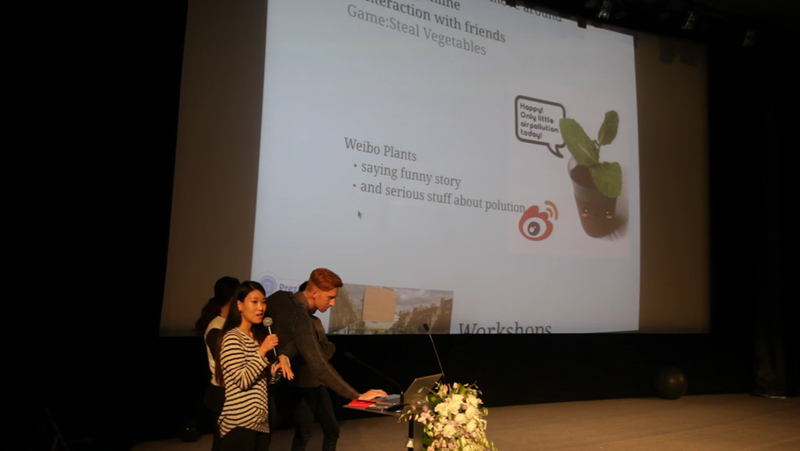 In addition ‘Weibo plants’ communicate and get educated about serious issues like air pollution in playful ways through environmental sensing and Internet of Things. In the 3rd phase Shougang ‘Organic Factory’ could become a hotspot for green industry in China by attracting business. This would mean that once again the Shougang company needs to change its core business: from steel to real estate to green business. Team 3 (Mark van der Net, Nora Zeng, Xu Lin, Peter Wang, Ton van Gool, Jeffrey Zhang) presented “Factory X”. They began by comparing the huge scale of China to the small scale of the Netherlands. They wanted to combine the small-scale Dutch approach, which is bottom-up, with the Chinese way to actually get big results. The team emphasized the emotional and poetic aspect of being confronted with the beauty and awe of the huge site. The challenge is to go from the negative connotation of emptiness to a more inviting notion of openness. The factory in fact is not really empty: it is filled with the memories of all the former workers that can be revitalized. Through narration this past legacy can be connected to the present. Likening the factories chimneys to Easter Island statues, one of the participants Jeffrey Zhang said: “the people are gone but the memories are still there”. Through various media platforms these stories could be gathered, stored and retrieved. This way, through narrating its past people learn about the hidden values of the factory site and can begin to imagine its future potentials. After the team presentations two invited guests commented on the work of the teams. These were Ole Bouman, curator of the Shenzhen Urbanism and Architecture Biennale that opens on 6 December 2013, and Yang Lei, curator of the Smart City expo in CMoDA during the Beijing Design Week 2013. Ole Bouman had been asked to also reflect on his experiences with one of the locations of the Shenzhen Biennale, a former glass factory in Shenzhen’s Shekou area. Ole explained how he had gone through an extended ‘reality check’ in working with his local partner, and in fact had become a kind of developer of the factory. The Shenzhen Biennale should act as a catalyst for urban change, and he encouraged the makers to reflect on value creation with digital media. Yang Lei reflected on the ways in which digital technologies can be used to put the issue of industrial heritage on the agenda in China. In two days the teams passed through multiple steps. They did so not just in a linear way but revisited some and checked their assumptions. We can formulate these lessons along the five areas in which digital media can help to strengthen ownership, which we have developed in multiple publications and on various occasions. First, the teams acquired a better view of what the issue of vacant factory space actually is about, how complex the issue is, whether and how the notion of industrial heritage is important. Second, they also got a better view of stakeholders involved. The playing field is quite different in the Chinese context where various government levels and entrepreneurs stand in a very different relationship to one another, and where other players are usually not part of planning procedures. Third, the teams got a good view of the qualities of the site, the people and the surrounding area. Moreover, it proved very valuable that the Made By Us team had paid visits to various other interesting parties the days before. These included the Institute for Provocation, MAD Architects, Dashilar area which was a BJDW hotspot, Urbanus Architects, 798/751 Art and Design district. In addition the smart city event at CMoDA allowed us to talk with various interesting organizations like Interactive Beijing and . Through these visits we got a glimpse of Beijing’s creative industries, creative working spaces, and therefore the potential of the Capital Steel Factory vis-a-vis other locations. In all of the team proposals the element of learning was central: learning about the site and its history, learning about how to set up a festival, learning new skills like how to creatively work with digital media or tend to an urban farm, developing ideas for the factory’s future, and last but not least team mates learning from each other’s different professional and national and cultural backgrounds. Pooling resources then is also about developing them collectively, often in playful ways. Fourth, the teams developed interesting ideas how to spark interest in the vacant factory. After all, it is very remote and its beauty not widely appreciated. The teams proposed to draw in new people by developing a clear and attractive identity for the now vacant site. Interestingly, they did so via small incremental steps and hence allowed much room in this identity management for future dynamics. Fifth, the use of interactive media as part of this strategy gives people not just something nice to look at but also to play with, to try out and test ideas, to imagine alternative possibilities, and organize themselves. Digital media then would allow people to become active co-creators of this vacant factory space instead of merely visitors. This enables them to say that the factory is indeed “made by us”. Some additional points I took from this event, and the workshop in particular, include a vision on urban planning that takes the factor time into account and sees it as a resource rather than a hindrance. In all of the proposals time is a strategic element that can be used in a non-linear process to create new values for empty spaces. The workshop also provided a possible alternative vision on urban planning culture in China, which generally speaking is organized in a very top down way. In China vacancy is a big issue too. We know about China’s empty theme parks, vacant high rises comprising complete neighborhoods, empty factory lots, and so on. Through a dialogue between Dutch media makers and young Chinese media- and urban professionals, different perspectives have been developed on vacancy. These views are more culturally driven than economically driven; they allow future multiplicity instead of offering yet another singular narrative; and most importantly, they involve the people as co-creators of their own cities. One last thought. Made By Us is a project about vacancy of industrial-age factory buildings and areas. Modern industries were the business giants of that era, the companies that made society tick. Many of today’s leading businesses include digital tech corporations (of course this is a matter of definition: on the Forbes 2000 list the highest ranking digital tech company at this moment is Apple on position 15. Oil companies and financial corporations still reign supreme). We could raise the very same question for these technology companies. Google, Microsoft, IBM, Apple, Samsung; what about the spatial manifestations in all these big IT companies the city? And how can we start thinking about an inevitably shifting future in which their spatial presence might be changing? I guess this future will come sooner than it has come for that old Capital Steel Factory. 09:30 Doors open at CMoDA Lab space. 10:00 Short introduction of day 2 (Michiel de Lange). 10:15 Continue analysis phase; developing initial ideas and directions. 11:30 Start with short round of team presentations of first ideas and findings; feedback by other participants, experts and team leaders. 12:00 From ideas to concepts. 13:00 Lunch, informal discussion of concepts. 14:00 From concepts to prototypes. 16:00 Finalization and preparing public presentations. 17:00 Public presentations with focus on process and outcomes (10 − 15 minutes per team), followed by feedback from panel of experts); Concluding remarks. The program Made By Us is partly funded by the Netherlands Creative Industries Fund.